*What is the title of the application? Who developed it? The title of this application is "Tada list". The only information I could find about who created it is a company called "37 signals". I found that information in the terms of service section of the Tada lists website. Plain and Simple, It is a to do list. But it also has other ways that it can be used. From things that need to get done around the house to, or places to visit, eat, or see while in Chicago or other locations. It can be used as a simple grocery list. Citing: All I did was visit the web page where I followed the easy instructions provided and created my own account. After that I actually played around with the list making tools and created sample lists to share with the group. For example, I made this list by signing in to Ta-Da List and then click on the "Create a new list" as shown below. Start adding items to your list. Just type in what you want in the box and then click "Add this item"
You are free to add other items to the list, edit the list, and even share the list! Citing: I signed up for an account and played around with making lists. I used the screen shot button in OneNote to capture the pictures. That is the correct Macro for the Youtube video to be embedded into this wiki. But the macro isnt part of the standard software. We might need to talk to Newby or an admin about it. 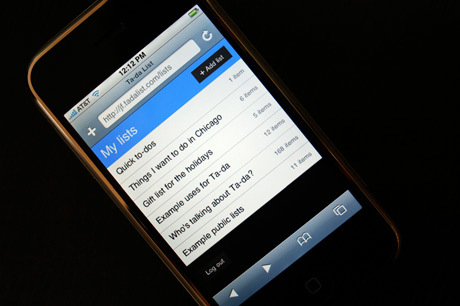 Ta-da List works in the most popular web browsers (IE 6/7, Firefox 2, and Safari 2) on the Mac, PC, and the iPhone. If you have an iPhone, just visit tadalist.com and you'll see the iPhone version. You can access the standard web version with your desktop web browser. Both versions share data and lists. Are we imagining it, or are mobile web applications getting a whole lot better since the Dawn of the iPhone? The side-effect of Apple's closed platform is an explosion of iPhone-friendly services, especially from the makers of the web's prettiest and most functional tools, such as 37signals' Ta-Da List for iPhone. Add in the iPod Touch and there's suddenly a big new web platform to develop for. We could incorporate lesson plans. Each curriculum could use the application in a different way. With the relatively simplicity of this program it could be used as a good learning tool for children with learning disabilities. They could be taught how to use this program to plan out and make goals for themselves with a teachers help. Then the students can mark it off once they accomplish what they set out to to. This will help some students to stay on task and in a generation with a growing number of children diagnosed with ADHD I would see this as very helpfull. students under the age of 13 cannot use this application according to terms and service. However, teachers could use this to make to do lists to make sure they accomplish each task necessary any given day. (Sheena Mitchell) :: There is a function that is listed later on this page. 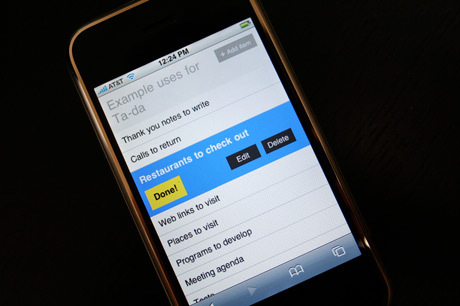 It states that Tada List can be used to keep track of new words and definitions. (http://jf.tadalist.com/lists/1605/public) For a postsecondary student (or instructor), this can be an imperative piece of information to have in order to keep the student or the instructor in-step with the changes that are happening terminologically and conceptually in the language of their country and other countries as well. (Sheena Mitchell) :: Again, as I was looking at the list of uses of Tada list at http://jf.tadalist.com/lists/1605/public, I noticed that there was the capability to list the necessary points to be covered in a conference call. I think that this, along with the capability of sharing the list, could be used quite easily in a business situation. An example of how this could take place is that in a management/subordinate situation, the subordinate could be required to submit a pre-draft list of conference call topics to the manager. At that point, the manager would either accept or reject the list. This process is just one example of how Tada list could be used to enhance the efficiency and productivity of a business. Comments on how we should go about that? ----What are some examples (e.g., web sites) of it being used to illustrate its current educational value or potential value? I have not found any websites as of yet that use this device. However I could see it being very valuable to people who get off task easily. Or that it could be used sucessfully with children who have mental handicaps such as autism. This device could be used to help them set goals for themselves and keep on task rather then straying away from it when distracted. Citing. I looked at several websites through google trying to find any that use this program but found none. I will continue to look however the ideas I expressed where of my own. I found a site that has some suggestions about Tada list. http://blog.taragana.com/index.php/archive/5-must-have-features-missing-in-tadalist-online-sharable-todo-list/ I think that it is good for us to show some suggestions that people have had to make the application better. One of their main suggestions was to have better control over the list sharing. Also, a time and date function was suggested. I think that this page could be beneficial for everyone to check out. As started at the top of the page by Robert Schroeder, Tada list is a simplified version of a feature from Basecamp. Both would be useful for educational value in their potential for helping people to remember to do things such as study, do homework, or simply to pack lunch for the next day. However Basecamp offers many other features that would be useful as well. This information was found at and more can be found at the FAQ section of www.tadalists.com.